Let the Blue Peter vs Magpie wars recommence! Something for the Weekend, Sir? Keep me in a cupboard. When the fancy takes you, let me out and I'll do your bidding. I won't mind as long as you make it worth my while. Hmm, that didn't sound right. What I meant to say was that I would like you to put me on retainer to provide consultancy advice. Unfortunately, what I actually wrote reads back like an elevator pitch by The Gimp from Pulp Fiction. Apart from the "expensive" tag, it's bit like being a policeman called in to intervene in domestic disputes that have exploded into violence after simmering for years. Solve it now! Yes, right now! Then go away and leave us alone, fascist! Business solutions thrown together in this way will fail to live up to their promise. And no wonder consultants are so expensive: for all their expertise, their hire period is so short they have little choice but to charge a lot. For every hour they spend on a task, they spend at least another two buttering up prospective clients for the next job. This does not strike me as effective use of their time. Perhaps I should offer myself as a consultant for consultants. Perhaps then I could curb their risible decisions unfairly inflicted on one client as a result of their minds obviously being distracted by thinking about the next. 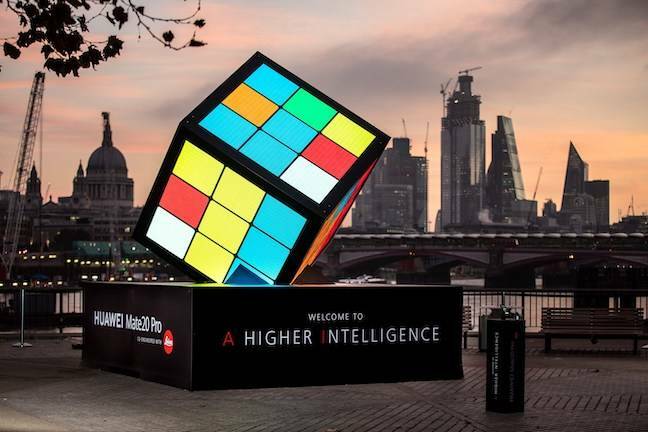 Surely such a scenario is the only explanation for Huawei's Mate 20 launch back in October being organised around a giant (and perfectly irrelevant) Rubik's Cube on London's South Bank. What were they thinking? That much is obvious: they were thinking about something else. Perhaps the consultant who came up with the idea was pitching to a Russian client while working on the Huawei account and got distracted. Yes, a giant Rubik's Cube might have attracted some attention on the day but not necessarily for the right reason or with the intended result. I mean, when Ryanair's publicity forays leave you thinking the airline is a bit crap, it doesn't matter; in fact, it could well be intentional. Is it really Huawei's intention to come across as confused, pointless and desperate? Now, if I'd been on the scene, I might have advised that harking back to the 1970s, before most smartphone users were born and a time when real life in the UK was still in black-and-white, should be avoided at all costs. Millennials would be muttering "what's that thing, grand-dad?" and for everyone else it evokes a miserable era of watching naff editions of Blue Peter when you knew the cool kids were watching Magpie instead. 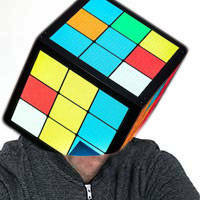 It doesn't matter that Huawei was trying to boast its handset's number-crunching AI mastery, the Rubik's Cube is a tiresome computing cliché that has pretty much nothing to do with computing. Don't do it. Huawei would have been better to let me out of my cupboard to say my piece, follow my advice to the letter, then shut me back in, knowing the retainer they were investing in Dabbsy's Cupboard Consultancy was well spent. I like the cupboard concept. It was first described to me at the end of the 1980s by my editor on ICL Today magazine as a fantasy career move for woefully undervalued freelance science journalist, (the late) Hedley Voysey. For those of you unlucky never to have crossed paths with the man, Hedley had the comportment of TV scientist Dr Magnus Pyke, possessed a brain the size of a planet and had a suitably planetary capacity to comprehend and process the most complex of engineering and technological detail almost instantaneously. And here he was, scrabbling around for meagre commissions from us to write dull case studies about ICL systems clients. Our editor would muse that Hedley ought to be kept in a cupboard. This cupboard would live at one of the top corporates of the day – IBM, DEC, even small-fry ICL at a push – for which Hedley could be paid a handsome retainer. Then, every time a project went titsup and directors ran around with their hair on fire, they'd let Hedley out of his cupboard to say "Ooh yes ah indeed, what you need to do is this…" The day would be saved, the world could breathe a sigh of gratitude and Hedley would return to his cupboard until the next disaster. My problem is that I have been "doing the cupboard" thing already without reaping any financial benefit. Huawei, for example, is already quids-in on my viciously incisive advice without spending a bean. Another recent example that springs to mind is the Magic UX smartphone interface concept from design and innovation studio Special Projects. It lets you fix physical locations in front of you for each of your running apps, allowing you to switch between them VR-style simply by moving your handset, as if passing from one pile of papers to another on a desktop. Watch the video. Naturally, I asked what happens to Magic UX if you're doing work on a train with your virtual apps spread across the table in front of you, and the train turns on a bend. Would your apps would slide around behind you, out of reach? It might be amusing to watch fellow users chasing their documents up and down the carriage, as if blown away by a gust of virtual wind. It could be like Pokémon Go but with Word files, server scripts and a private browser tab playing the full Pulp Fiction Gimp sequence (director's cut) on a loop, all flying around with every kink in the tracks. After an initial exchange of emails, the conversation went quiet very suddenly and I have heard nothing since. I just want you to know that these were freebies. Any future consultations will be subject to contract and lead to an invoice. Much against everyone's advice, I advise you to take mine. You can contact me any time, here in my cupboard. I know what you're thinking, so don't bother. I have a spare key.